For this evening’s brief update there is yet more linting action including some visual changes (plus a screenshot below the fold) and some other code cleanup in that general area. I ran over the amount of time I had allotted to this since I was also going to work on some video editing, but that’s just how things roll sometimes. If you read yesterday’s post you will notice that this is very similar to what it looked like then, but with some small formatting changes. It was a little displeasing that the messages didn’t line up with each other because they were offset based on the position information. There is also a separating @ character between the message type (which is longer than before) and the position because it looked visually weird to just see the numbers bumping up on the type. I would much rather focus on the message more, having it appear first with the position on the end of the line. 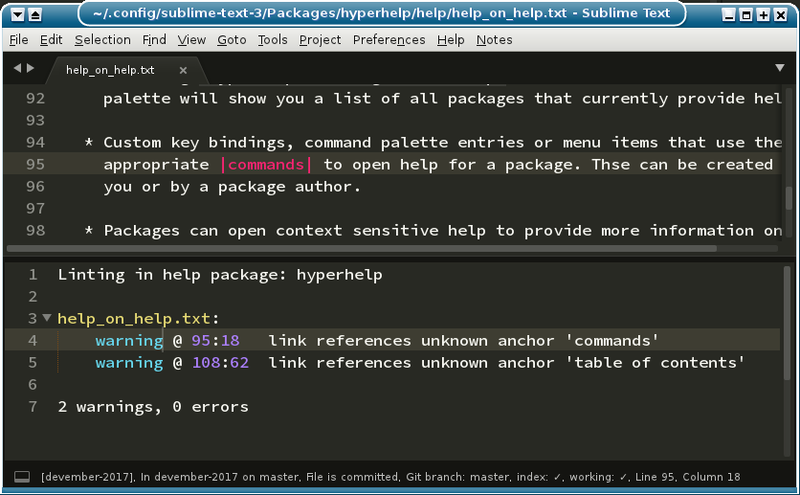 However I’m using the result navigation that’s built into Sublime so you can double click on items to jump to the appropriate location, and in that system the order in the file has to be file, line, column, message and I want to capture the message for potential use elsewhere, so it has to come last. My time went over because I got a little hung up on the (admittedly sparse and crude) syntax by making a stupid blunder that it took me a while to spot. As with the core hyperhelp syntax, this needs work to be better and is just a stand in for now. In particular I’m not very keen on making warnings appear blue, but it at least makes them jump out at you a little bit. Going back to the navigation, thanks to the internal powers of Sublime you can double click on the name of the file to open/focus it, or you can double click on one of the messages to also have the cursor jump to the appropriate location. In the screen shot above that’s how the |commands| link was focused. Apart from this, there was also some code cleanup in the linting and the base command has been pushed back to the main commands. The new linting code additions allow the command to automatically determine what linters it should execute based on how the lint is being performed, so future changes won’t need to touch it at all (probably). There is still a missing linter that needs to be added to finish up the minimal version of the authoring tools that I’m aiming to have done by the end of the year, and then the rest of the development time will most likely be in small code tweaks and working on help for the core package itself.